As well as running Chateau de la Vigne, I am a Masters Qualified nutritionist practicing in the UK. 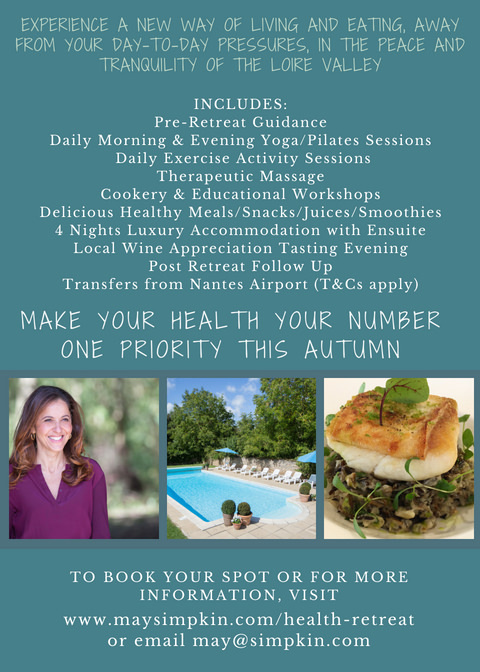 I’m so thrilled to be able to announce my next Yoga Health Health Retreat for this Autumn and delighted to have my fabulous team return for the 4th year running to offer you the very best experience. However, planning this retreat has been even more exciting this year as we have an fabulous Channel 4 TV project working with us on this one! Can’t divulge too much just yet but I will share details if you’re considering joining, so you’re fully in the picture! Join me for a 4-night Yoga Retreat in the Loire Valley, France from September 8th-12th! This retreat is based right here at Chateau de la Vigne, which I have owned and run for the past 18 years. I’ve put together a fantastic schedule, based very closely on last year’s highly successful retreat with my expert team and I’m absolutely thrilled to be sharing this dream break with you all. 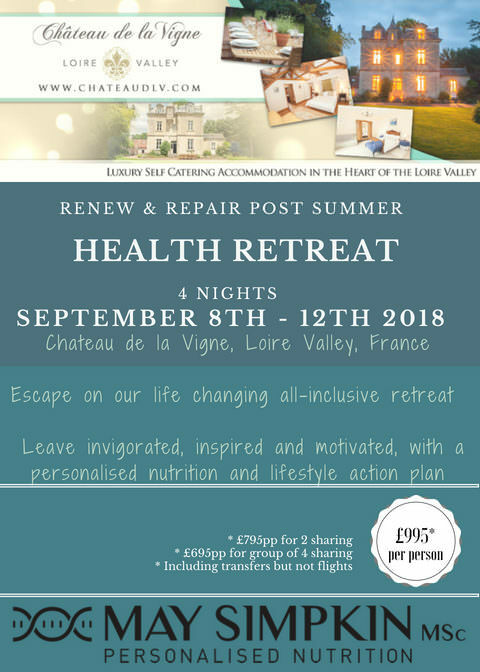 We’ll practice yoga twice daily, walk or cycle in the peaceful and tranquil French countryside, cook some fabulous recipes together and enjoy delicious healthy meals. We’ll also get out and about and you’ll have an opportunity to visit the beautiful nearby town of Saumur, the local vineyards and even enjoy a private wine-tasting session with a top sommelier. With the weather still gorgeous but the summer crowds dispersed, September is a beautiful time to visit this beautiful region. Please note that this retreat is open to all level of yogis, from beginners to long-time enthusiasts. Our expert instructor has years of experience behind him and you’ll know you’re in good hands within seconds! We have been running our retreats for 4 years now and they’re getting better and better! 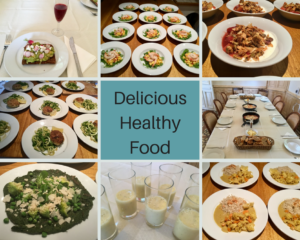 The essence is on relaxing and experiencing a new way of eating and living but it is very important that you also leave with a clear idea of how to continue some of the things you have experienced on the retreat – we help you with that! It’s a beautiful and tranquil setting and a lovely group of like-minded people. I love running them, along wth my team who are all experts in their field. What’s Included in your Health Retreat? Flights & Travel insurance…that’s it! Remember, this is an intimate retreat in a historic home! 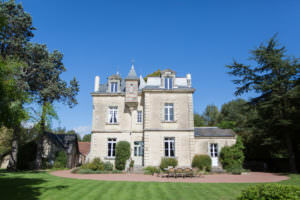 The Chateau is large and luxurious and has 5 bedrooms- 3 double, 1 twin and 1 four bedded room – all ensuite. The top floor has a very large king bedroom with ensuite bathroom/separate shower, as well as a separate four bedded room attached, with ensuite shower room. On the middle floor, there is a beautiful suite with ensuite bathroom. There is also another double room, with ensuite shower and a twin room with ensuite. The reception rooms downstairs are very spacious and well furnished; perfect for large groups! All the rooms are beautiful and well furnished and accommodation will be allocated on a first come first served basis. The easiest way? Fly into Nantes airport and we’ll pick you up. The car option? Of course, you can always drive; it takes 5 hours from Calais and it’s an easy run all the way through. The dates of this retreat are Saturday 8th September – Wednesday 12th September 2018. The 4 night retreat costs £995pp – all inclusive. This retreat has extremely limited spots and is likely to sell out quickly. A £250 non-refundable deposit is required to reserve your spot and payment plans are available. Don’t forget, you’re welcome to email me at may@simpkin.com with any questions or concerns whether this is the right retreat for you. I can’t wait to welcome you all on this special and possibly life-changing experience! !